The Primeknit upper of the shoe model is loved by many users because it makes the shoe comfortable straight out of the box. The same users mention that the Adidas Dame 5 is as comfortable. A lot of buyers call the traction a beast because of how good the Adidas D Rose 7 Primeknit performs on court. Many owners love that the Primeknit looks plush and expensive. 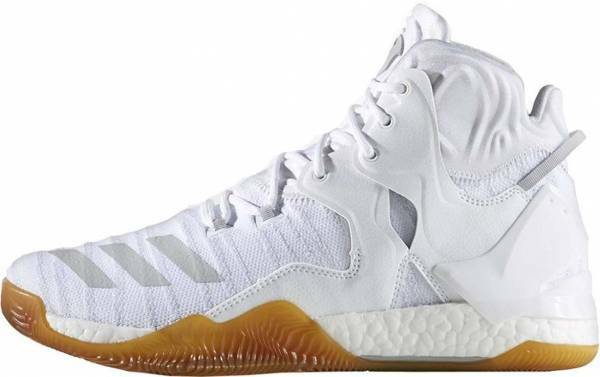 A good number of reviewers agree that these Adidas basketball shoes do not need break-in time. Plenty of purchasers praise the shoe because of the external TPU on the heel counter, which helps avoid slippage. A handful of customers commend the Boost technology used on these D Rose basketball shoes. The responsiveness of the technology aids people with knee or back pains. The padding and TPU on the heel counter give a suffocating feeling to the ankles, say a few users. The 10th Nike Hyperdunk comes with the same complaints. Several owners mention that the outsole does not have the same amazing court grip as the outsoles of the regular Derrick Rose shoes. The outsole is soft and accumulates a lot of dust according to a number of reviewers. Some testers with wide feet left comments that their pinky toes keep hitting the toe box because of how soft the Primeknit is. The Adidas D Rose 7 Primeknit is an amazing performer like the regular version. Many are asking sneaker reviewers if the $20 price difference is going to be worth it. The answer still depends on the priorities of the new buyers. If you are an athlete who prefers superb traction and lightweight shoes, the regular D Rose 7 should be the choice. But if the concern is more on the fit and a better-looking upper, then go grab the Adidas D Rose 7 Primeknit. For $20 get the primknit version. I really can't recommend the Rose 7 over the Rose 6. With the Primeknit version, the shoe is near perfect right out of the box. So the D Rose 7 Primeknit is one hell of a shoe. Adidas released a Primeknit version of the Adidas D Rose 7. The two shoe models are almost identical. Both have the same excellent traction and Boost technology. The difference would simply be the material in the upper. Cushion. The performance of the shoe model lies on the full-length Boost in the midsole. It delivers maximum impact protection without compromising court feel. To enhance the stability and support of the shoe, a torsional spring plate is installed in the midsole. Traction. The Adidas D Rose 7 Primeknit has a full herringbone traction pattern like its regular counterpart. The shoe model has a translucent rubber outsole instead of the solid rubber one that the regular version has. The sturdy shoe performs well both indoors and outdoors. Length and Width. The Adidas D Rose 7 Primeknit is built with the standard length and width. However, because of the softness of the material in the upper, new buyers have a choice to go down half a size or true to size, depending on their preference. People with wide feet are advised to go true to size or go up half a size. Lockdown. The lockdown of the shoe depends on the traditional lacing system, the TPU on the heel counter, and the Geofit technology in the inner of the shoe. The round shoe laces can be adjusted to obtain the desired fit. The TPU on the heel counter helps hold the heel to prevent it from moving around. The Geofit technology is the strategically placed foam in the inner part of the shoe. It enhances the fit of the shoe around the ankle. The upper of the shoe model is composed of Primeknit with fuse overlays. Because Primeknit is softer than engineered mesh, it is more breathable and flexible. This also provides more room in the toe box. There are some reviewers who suggest replacing the insole with a thicker one to lessen the dead space in the forefoot area. Adidas D Rose 7 Primeknit has a one-bootie construction. The shoe model comes in different colorways. The Three Stripes of Adidas are displayed in the forefoot area. The company callout and logo are in the lateral side of the heel counter. This is a signature shoe for Derrick Rose, so his famous logo is meticulously placed on the tongue, where it can be seen at first glance. Sneakersnstuff collaborated with Adidas for the World Tour that comes after the release of the D Rose 7 Primeknit in December 2017. The result of the collaboration is a unique rendition of the D Rose 7 PK, which is bathed in soft gray with yellow and blue accents.